In addition to being against Georgia state law, texting while driving creates the same level of impairment as driving under the influence. If you’ve been injured by a driver who was texting, you’re entitled to compensation for your accident-related expenses. As smartphones become more common among all age groups, the number of distracted drivers who are texting behind the wheel continues to rise. At any given moment, it’s estimated that roughly 660,000 drivers are using cell phones or manipulating similar electronic devices to read or send text messages. The dangers of trying to concentrate on the road while texting have been well publicized. Drivers come up with a wide range of reasons to attempt to justify their risky behavior. Some claim they’re natural multitaskers, while others say they text only at red lights. Another common tactic is to hold the phone near the windshield so it’s easier to see both at the same time. However, none of these justifications has been shown to reduce the danger associated with texting and driving. 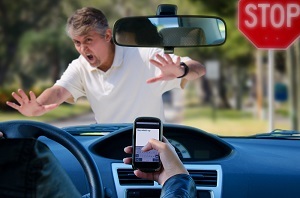 Even a fast texter is looking away from the road for at least five seconds per message. Assuming the driver is traveling at 55 miles per hour, this means he’s traveled the length of a football field without looking at the road. In this time, a driver could miss a red light, veer into the wrong lane, fail to see debris in the road, or accidentally pull in front of another vehicle. Any one of these actions could result in an accident with serious or even fatal injuries. Drivers who text have a 23 percent higher chance of causing an auto accident. The National Safety Council states using cell phones while driving is responsible for approximately 1.6 million accidents annually. This figure represents about 25 percent of all auto accidents. In comparison, 31 percent of all traffic accidents are caused by drivers under the influence of alcohol or drugs. Although auto accidents involving intoxicated drivers have been decreasing in recent years, accidents involving texting drivers are increasing. The Brain Injury Society states that texting while driving creates roughly the equivalent impairment of having four beers before getting behind the wheel. For most adults, this would make them at or over the legal limit for a DUI charge. Texting and driving laws are becoming more popular as a way to keep the roads safe for everyone, with 39 states plus Washington, D.C. prohibiting all drivers from texting while driving. There are 32 states plus Washington, D.C. that forbid new drivers from cell phone use. Georgia bans cell phone use for school bus drivers and novice drivers with a learner’s permit. However, texting while driving is banned for all drivers regardless of their age or type of vehicle. You may not use a cell phone, text messaging device, PDA, computer, or other wireless device to write, send, or read text messages, instant messages, email, other text-based Internet data while operating a motor vehicle. However, it is acceptable to conduct such activities while you are fully parked. Since texting while driving is illegal, a texting driver would be found at fault and held financially liable for any resulting injuries. To date, there have been no cases involving an action being successfully pursued against someone sending a text message to a driver. However, one New Jersey court decision stated that the sender of a text could hypothetically be found liable if it could be proven that the sender was sending texts that he knew would be read immediately by the driver. If you’ve been injured in an auto accident caused by a distracted driver who was sending or receiving text messages, you can seek compensation for medical expenses, lost wages, and pain and suffering. If you’ve lost a loved one in a texting and driving accident, you may be able to file a wrongful death suit for medical expenses, lost wages, pain and suffering, and funeral or burial costs. Rechtman & Spevak is committed to helping accident victims receive compensation for the damages they have suffered due to the negligence of texting drivers. Fill out our online contact form or call 404-355-2688 to speak to one of our car accident attorneys.